The R8 DAC has a similar appearance as the Master 1 preamp but because it is part of a different range, it uses panels that are shaped and constructed slightly differently. Nevertheless, it has the same purposeful looks and only a minimum of buttons on the front panel to make for a clean aesthetic. There is no remote control but the DAC offers a lot of options and this can appear daunting at first, especially when you’re not yet used to the somewhat strange logic that is used to change the settings using the aforementioned buttons. Indeed, I feel that its operation would have been more straightforward if they had opted to add two dedicated buttons for value changes but once you get the hang of its logic, you’ll be fine. The R8 is a balanced discrete R-2R digital-analog converter equipped with advanced high-speed ladder correction including optimized FPGA FIFO buffering and re-clocking. Two high-performance TCXOs (Temperature-compensated crystal oscillators) are used to process the 44,1kHz and 48kHz sampling ranges. After D/A conversion by the R2R modules, the analog signal is output via fully discrete, DC-coupled, matched-transistor output stages. 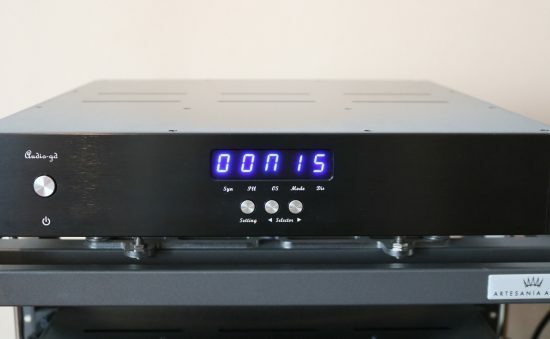 Built-in 2X, 4X and 8X oversampling and digital filters as well as 4 different true NOS modes using 6dB analog filtering which makes for one highly configurable DAC. A true discrete Resistor Ladder DAC means that rather than a standard chip, it uses a range of resistors that are basically switched according to the number of bits used at any time in the audio stream. Naturally, these resistors need to be of very high accuracy but as the manufacturer points out, low tolerance in itself is not enough. The following calculation is used to point that out. At 16 bit, a tolerance of 1/66536, 0.1% (1/1000) is not enough to achieve decent performance. Even when using resistors with 0.01% (1/10000) tolerance, which is the lowest tolerance available today, the desired performance cannot be obtained and this is just 16 bit. To process 24-bit resolution it would require resistors with a tolerance of 0.00001% which is purely theoretical. Even if this tolerance would exist, the switch logic chips will already have too much internal impedance and will shake-up such design. So, the tolerance of the resistor will never solve the Imperfections of a ladder. The solution lies in the combination of ultra-low tolerance resistors controlled by a correction technology using very high speed with parallel FPGA processing. As the manufacturer points out, many competing R2R products, especially affordable ones, use only the basic conversion and not the correction technology and therefore, they do not achieve the same level of accuracy. Every audio component is only as good as its power supply, so just like with the Master 1 preamp, the R8 DAC has a heavy emphasis on its power supply, using 3 R-core transformers and 21 low-noise regulation stages. 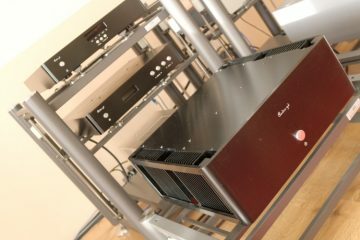 There is a lot more info about DAC technology on the Magna Hifi website, including the pros and cons of R2R versus Delta/Sigma so if you are interested, be sure to check that out. Although the R8’s main selling point is clearly its R2R conversion of PCM signals, the DAC also supports high-resolution formats including native DSD64 – DSD512 as well as DxD. 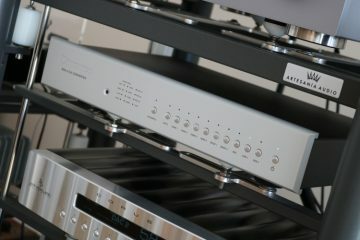 Unlike some other DACs, the R8 does not convert DSD to PCM but rather processes this via a separate converter. Personally, I only use PCM source material and don’t care much about DSD but I certainly appreciate the separate paths philosophy. A derivative of the more expensive R7, the R8 is said to preserve the same musicality with only minor changes to some parts of the circuitry. For instance, the output stages of the R7 are all independently buffered while the R8 uses a single buffer for all its outputs. That in itself is no issue at all and may even result in better sound. The downside of this is that you can’t use its cinch and XLR outputs at the same time. You can, however, use ACSS and any of the two other outputs simultaneously. The R8 has plenty of inputs for every conceivable source: AES/EBU, cinch, TOSLink, I2S on HDMI, and USB. The latter uses the Amanero USB class 2, 32bit chipset, rather than the often used Xmos solution. As with the Master 1 preamp, outputs are provided as cinch, XLR, and balanced ACSS. A very important aspect of an audio component’s delivery for me is tonality, or rather, that they sound natural. With the classic Sony ES components and later also with certain Chinese components, I found that the sound was somewhat synthetic, in other words, it was acoustically not convincing for me. This is not something that can be tagged onto entire countries such as China and Japan, though, as clearly proven otherwise by the very natural sounding Accuphase and various other Chinese products that I reviewed. Rather, I think it is related to design choices and the selection of internal components, as well as the way that I interpret reproduced music with my systems. In any event, the Audio GD components have a wholly natural presentation: there is no artifice here! 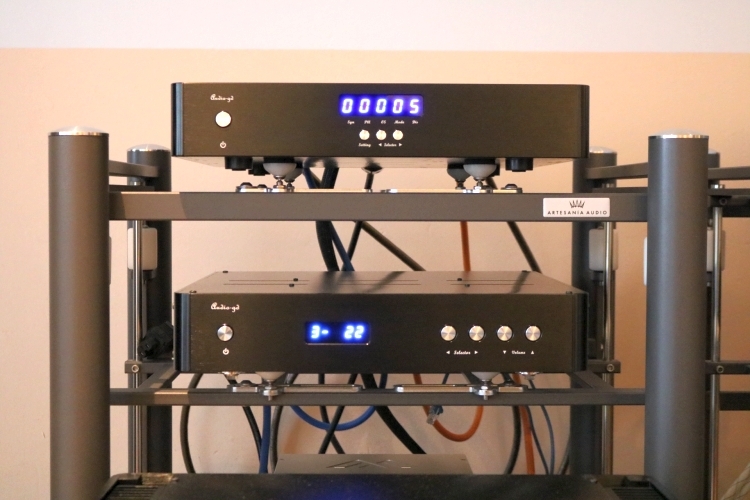 The obvious comparative partner for the R8 in my arsenal is the Aqua Formula xHD DAC because both DACs employ discrete R2R resistor conversion. At over 13K euro, however, this is, again, not a fair comparison. Using the Final Touch Audio Callisto USB cable and AudioQuest Water cinch interlinks for both DACs, there was absolutely not the huge difference that I was expecting. The Aqua is a little smoother, more refined, especially in the treble, and it also has an even more linear presentation, flatter in perceived frequency curve so to say. So, the Audio GD is less well-differentiated, a little bit rougher and not as ruler-flat. But that really is all there is to it. Otherwise, I really cannot say that there are any meaningful sonic differences between these two DACs. And that really is a remarkable achievement. For the most refined sound, I found that the Final Touch Audio Ganymede worked best and the Cardas Clear was also a good combination. The Vermouth Reference XLR yielded a more sonorous and more powerful and very precise sound but in this case, I preferred the gentler and airier treble performance of the other two cables. The best setting for my ears: sync and PLL set to zero and no oversampling. The number of options that the DAC offers can seem overwhelming at first but when you get down to it really is quite simple. Basically, you have the option to listen with or without oversampling, the latter commonly referred to as NOS. Where it gets a little bit more complicated is that in each of these settings you have further options to refine the sound. In the oversampling mode, you can select 1x, 2x, 4x, or 8x oversampling. Between these 4 options, I don’t hear a whole lot of difference but your mileage may vary. In the NOS mode, you can select mode 1 (simplest data process), mode 2 (data FIFO process), or mode 3 (fastest data process). Between these modes, I hear clear differences, mode 3 sounding smoother and more “filtered” and mode 1 sounding most articulate and direct. Mode 2 I don’t really know what to make of but it also has a certain “filtered” just like mode 3. Of all the options, I most prefer NOS and mode 1 but I also like 1x oversampling for its slightly smoother presentation than either of the NOS modes, which may work very well in systems that inherently are a little forward or possess a little edginess. With the Kroma’s and the Naiu Ella amp, I have a clear preference for NOS mode 1. In this mode, it most resembles the Aqua Formula xHD DAC and it was in that mode that I made the comparisons. The first discrete R2R DAC that really blew me away was the 1600 euro EC Designs Mosaic T-DAC. 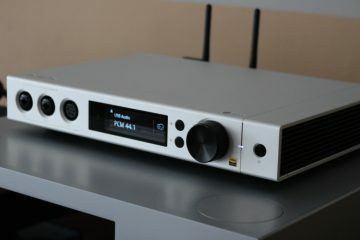 This DAC managed to outperform much more expensive DACs, primarily in terms of refinement and purity, but ultimately fell through for me because its bass lacked attack and drive, due to its very purist design that does not use any output stage. 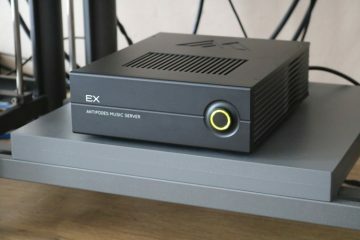 The next discrete R2R DAC that had me smitten was the Aqua Formula xHD and it did all that the Mosaic did along with tuneful and powerful bass. The Aqua has a hefty 13.670 euro price tag but to this day it remains my reference in its price class. Where does this leave the Audio GD R8? Pretty darn close to the Aqua, actually! Apart from the Aqua, it is with ease the best discrete R2R DAC that I have heard. And even when taking “regular”, non-discrete R2R DACs into account, all the ones I really liked invariably carried 5000+ euro price tags. I’ll refrain from mentioning the Audio GD prices just a little longer but suffice to say that the R8 is A LOT less than that. Although the Kroma Audio Carmens managed to stay out of sight in most of the pictures, the majority of the review has actually been conducted with these speakers, with the Wilsons moved to the side of the room. I already explained the principle behind ACSS in part 1 of this review but now I’d like to dive more into the format’s aural aspects, relative to the cinch and XLR connections. 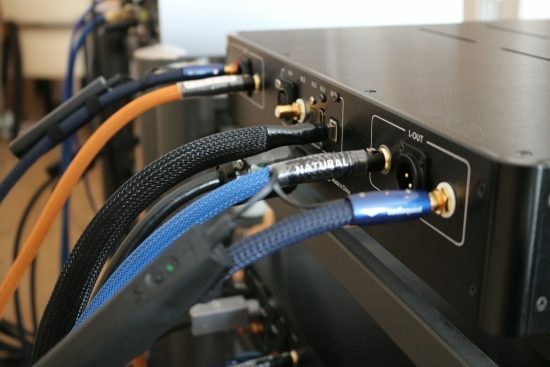 Along with the Audio GD components, Jos delivered Audio GD ACSS cables as well as Magna Hifi M-Way ACSS cables which they manufacture themselves. Starting with the Audio GD ACSS cables used between Master 1 preamp and R8 DAC, I was quite astounded by their performance. Although less colorful or less timbrally rich than some of my other cables, even these very affordable cables managed to outperform any of the other cables by sounding a lot less restrained dynamically and by having much freer soundstaging that was also more enveloping. The ACSS cables somehow allowed for better 3D imaging and a larger swing in the depth plane, images being more behind the speakers as well as more in front of them. Audio GD ACSS cables in black and Magna Hifi M-Way ACSS cables in red and blue. 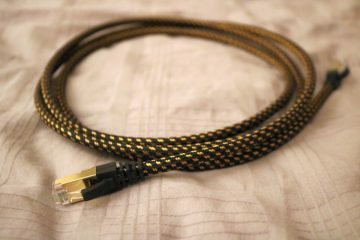 Further upping the game with the Magna Hifi M-Way ACSS cables, the aforementioned advantages of the Audio GD ACSS cables remained but enhanced with a smoother, more natural delivery that was more voluptuous and more richly textured, yet, while retaining the transparency and without sounding too warm. These cables make the Audio GD components sound richer and more relaxed yet still crystal-clear and with infectiously spot-on pacing. 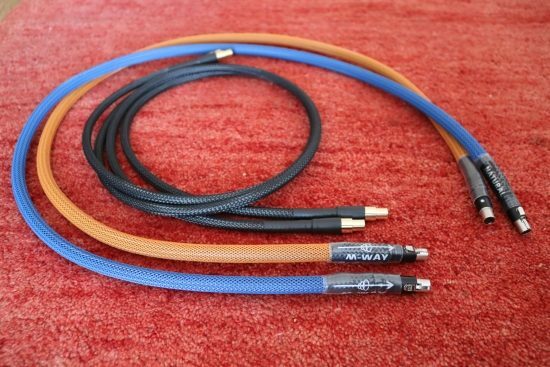 What convinced me most of all about the M-Way ACSS cables was the combination of factors such as even-handedness, warmth, and transparency and a seemingly ruler-flat frequency curve as well as a dynamically more outgoing and more free-flowing delivery. 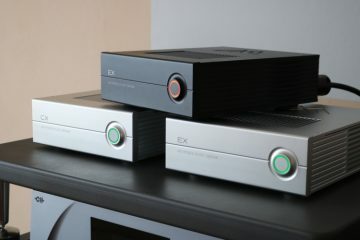 In the section about the R8 DAC, I mentioned how it compares to the Aqua Formula xHD DAC, both using cinch cables. Switch to M-Way ACSS connections between R8 and Master 1, though, and the difference in quality between the two DACs becomes a really close call. With these cables, on the one hand, the Audio GD now had the upper hand in terms of depth of soundstaging and the feeling of being enveloped by a more free-flowing sound, on the other hand, the Aqua (with no ACSS connections) still sounded a little bit more refined and transparent and refined. The M-Way ACSS cables outperform all the other cables that I tried, including Cardas Clear and Hexlink Golden 5C, Vermouth Reference, Final Touch Audio Ganymede, and AudioQuest Water. These cables do all offer a change in perspective and of course one could opt to tweak the sound that way. 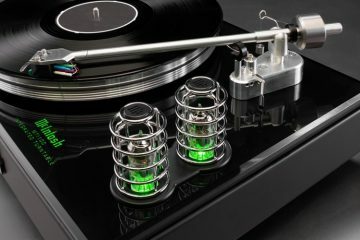 For instance, the Hexlink sounds fuller and more voluptuous, the Vermouth sounds more solid and precise and the Final Touch Audio sounds more relaxed and more seductively refined. However, their relative merits aside, all these cables’ presentation with the Audio GD components is somehow more business-like, more matter-of-fact than with the ACSS cables. I can only conclude that Current Conveyor Technology, in this case in the shape of ACSS, absolutely has a considerable added value over XLR and cinch. Audio GD has a history of being highly tweakable. 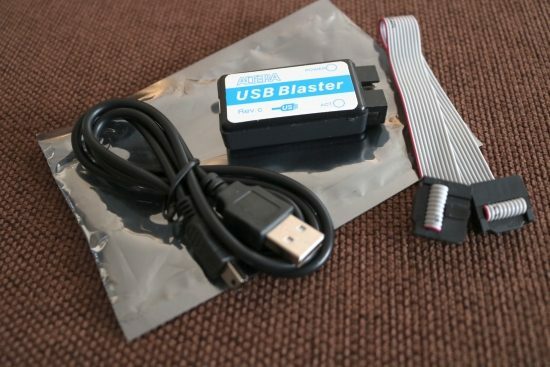 Older generations of their equipment could be altered in many ways by replacing jumpers inside but current generation equipment can be updated by using a USB Blaster as pictured above. This way, one can upload firmware updates that allow new features such as a TDA1541 emulation with two passband options and other NOS/OS options. Currently, 4 firmware issues are available for the R8, free of charge. 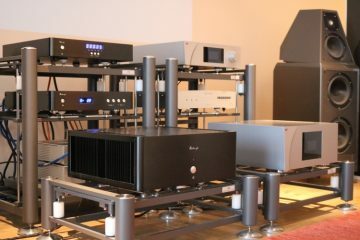 If required, Magna Hifi will assist with the process. If you haven’t looked them up already, finally, here are the retail prices in the Netherlands, including 21% sales tax. Now tell me, honestly: did you expect them to be this low? I certainly did not. 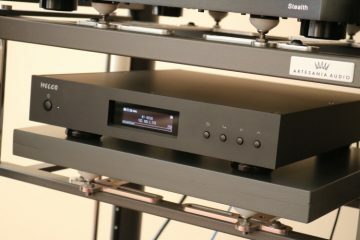 I’ll be honest: I think that the R8 DAC is the star of the show, sounding very nearly as good as the Aqua Formula xHD DAC which given its low price is an amazing achievement. But don’t assume that the Master 1 preamp and Master 3 power amp are mere bystanders. This pre-power pair also offers extremely good value for money, delivering a combination of transparency, neutrality, and even-handedness that is normally impossible in this price class. I think you can easily spend double the amount and not get better sound. But the most amazing aspect of all is perhaps the further increase in performance when all the components are wired using the proprietary ACSS connections, giving the system such a leap in performance that it becomes impossible to fault, even in the company of esoteric hardware. Oh, and should you still be worried about the build quality of these products then the 10-year (!) warranty should instill confidence. and you have not heard the big-brother R7…..
and yes…..it is right…the front panel as its own logic……but once you get it, it is clear. I am waiting for Master 3 and Master 1 to arrive at my house soon, and I am already a very happy owner of an R8 dac. 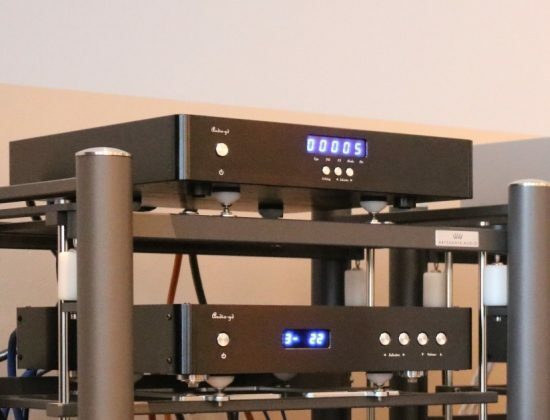 After testing a Metrum Ladder dac recently at an international Audio Show in Australia where we presented our speakers, I decided to have a ladder dac in my system. 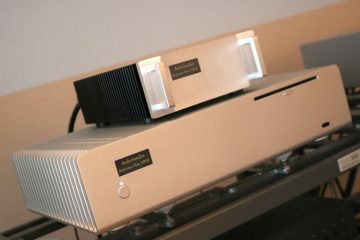 The Metrum is a great dac, but I think the R8 is even better. But to be fair, it is difficult to confirm it without making a side by side comparison with the same audio system. All I can say is that in our system and for the first time I have listened to the most analog sound of any digital component to date. I am of course not in any manner involved or part to Audio-GD business. I am just an audio enthusiast! tranparency, timbre, soundstage, articulation and precision. not to mention that the R7 (and R8 as well) has 4 different algorithms to match your personal taste, and firmware updates. I decided for Audio-Gd thanks to the great work of the Reviewer himself. Otherwise the brand itself is quite obscure and unknown. 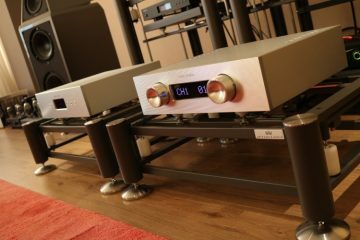 Christiaan’s transparency, precision impartiality and deep-technical background makes reading hifi-advice reviews a real pleasure. Thanks Luca, it’s great to receive such feedback and I’m glad to hear that you are so happy with your Audio GD components!